A successful identity governance strategy can move your organization toward sustainable compliance, reduced risk, improved service levels and lower operational costs. This guide is designed to help ensure a smooth, speedy journey all along the way. It covers everything from building a solid understanding of today’s business goals, reviewing the available choices, and planning for and selecting a technology solution. Designed as a workbook, with checklists and targeted, detailed information, it’s a practical tool that you can use to build a request for proposal (RFP) and conduct a side-by-side product analysis. 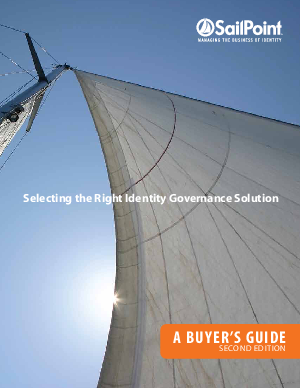 In the pages that follow, we show how identity governance can be a powerful force for risk management and business improvement on several levels. We present typical concerns and issues that identity governance can address. We introduce you to pathways to implementing solutions. And we help you assess your functional priorities — with checklists that can help make sure you don’t overlook anything.